Ontario jewelry studio 2 Sisters Handcrafted has announced its men’s and women’s recycled bronze, hand stamped Earth Day 2014 necklaces will included in The Artisan Group® Earth Day Gift Bags, to be delivered April 22 to some of Hollywood’s most eco-conscious celebrities. In honor of Earth Day 2014, Ontario, Canada jewelry studio 2 Sisters Handcrafted (www.twosistershandcrafted.com) is gifting its personalized, hand stamped Men’s Bark Dog Tag Necklace and Women’s Branch & Leaf Necklace to some of Hollywood’s most eco-conscious celebrities as part of an exclusive Earth Day Gift Bag being prepared by California-based The Artisan Group®. 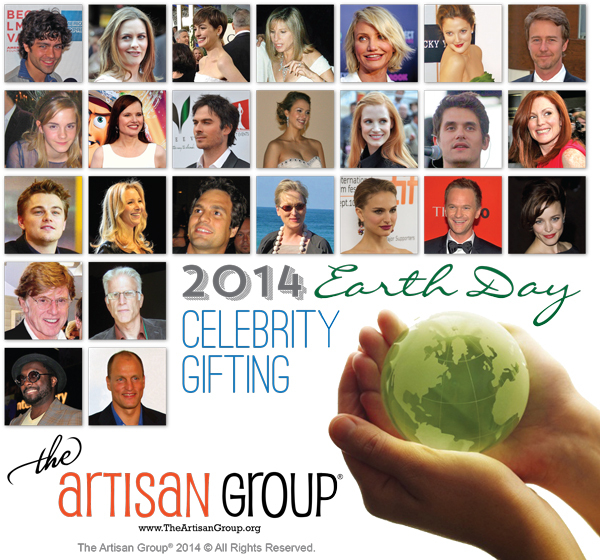 The Earth Day Gift Bag, which is comprised entirely of eco-friendly handcrafted items from The Artisan Group members, will go to Jessica Alba, Emma Watson, Edward Norton, Adrian Grenier, Will.i.am, Robert Redford, Leonardo DiCaprio, Drew Barrymore, Woody Harrelson, Jessica Chastain, Anne Hathaway, Julianne Moore, Ted Danson, Meryl Streep, Cameron Diaz, John Mayer and others. Colleen Johnson, owner/creative designer at 2 Sisters Handcrafted, made the necklaces especially for the Earth Day 2014 gifting, using recycled bronze metal clay that she sculpted, textured, hand-cut and kiln-fired to create the solid golden bronze bark, branch and leaf elements, which hang off of contrasting oxidized sterling silver chain. The Bark Dog Tag Necklace is textured to recall tree bark. When creating the piece, Colleen envisioned the tree knots where people carve their names and decided to build such a knot into the pendant, knowing it would be the perfect place to hand stamp the gifted individual’s last name initial. See how Colleen’s designs evolved by visiting her Pinterest inspiration board. 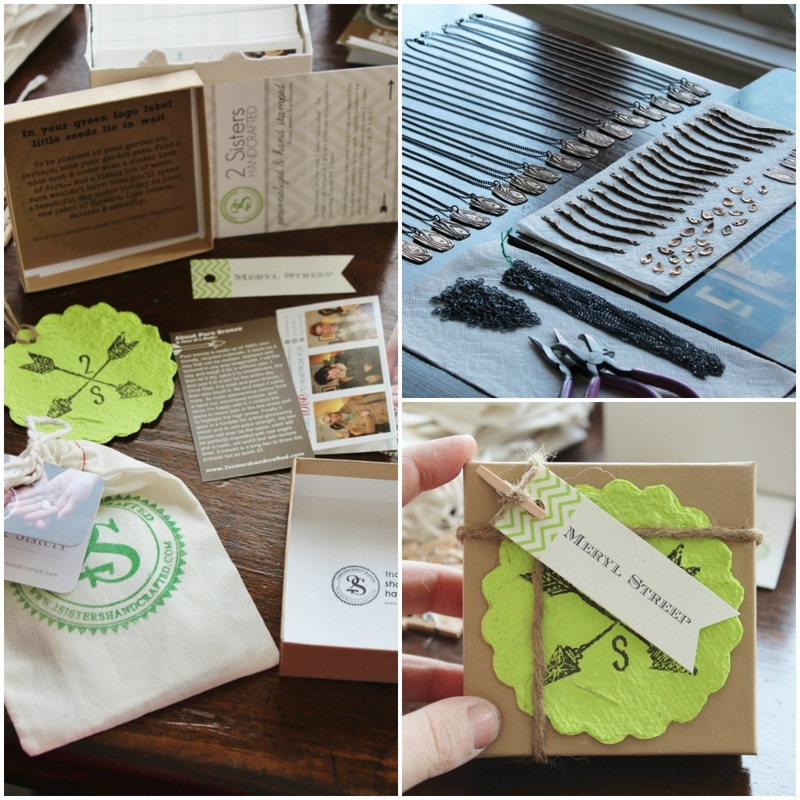 Recipients of The Artisan Group’s gift bag will find their 2 Sisters Handcrafted necklace packaged inside a Kraft recycled paper box tied with jute string and tagged with lime green plant-able seed paper that Colleen commissioned from a paper artist especially for the occasion. “I love the fact that the seed paper can be planted in a garden, watered and natural wildflowers will grow – it’s the perfect earth-friendly packaging,” she smiled. The Parties interested in acquiring their own personalized Bark necklace or Branch & Leaf necklace can place a custom order through the 2 Sisters Handcrafted website. 2 Sisters Handcrafted began in 2011 as a creative outlet for Colleen while she stayed home with 2 young children. Eventually what was a hobby became a shop. Over the years, the shop has blossomed into a business. 2 Sisters Handcrafted has created custom pieces for celebrities at the 2013 Academy Awards, the 2012 Primetime Emmy Awards and the 2012 MTV Movie Awards. It has gifted celebrities at the Official Celebrity Gift Lounge for the 46th Annual Country Music Awards and wardrobe stylists for The Vampire Diaries, Scandal, The Voice and The Originals. The company’s jewelry was worn by Bonnie (Kat Graham) on Episode 412 of The Vampire Diaries. Other celebrities who have 2 Sisters Handcrafted jewelry include Selena Gomez, Sarah Jessica Parker, Khloe Kardashian, Jenny McCarthy, Christina Hendricks, Nia Peeples and her daughter, Amanda Seyfried and Stephanie Drapeau. To learn more about 2 Sisters Handcrafted, visit www.2sistershandcrafted.com or contact Colleen Johnson by email using the Contact Author button to the right. Follow 2 Sisters Handcrafted on Facebook, Twitter, Instagram and Pinterest. 2 Sisters Handcrafted is a proud member of The Artisan Group. 2 Sisters Handcrafted (www.2sistershandcrafted) is the home of jewelry by Colleen Johnson. Colleen handcrafts each piece from start to finish in her studio in Barrie, Ontario, Canada. Her custom jewelry is hand stamped with names, dates or meaningful phrases, making them special keepsakes to treasure for a lifetime. Colleen especially loves how clients over the years have invited her into their lives to share the stories behind the custom pieces they have ordered.